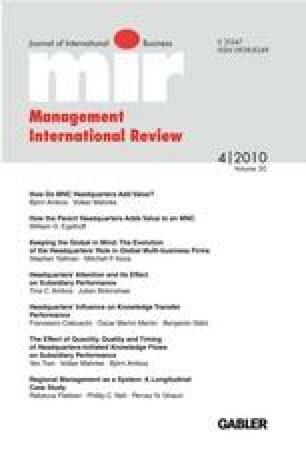 We apply information processing theory to investigate the evolution of regional management. Based on a longitudinal case study of a European multinational we capture the overall structural development of the firm and within this context, we conduct an in-depth analysis of two regions and their regional management centres. We conceptualise regional management as a system of differentiated centres. The notion that headquarters can be found in a single location is replaced by the view that headquarters’ activities are spatially distributed within a system. Over time, this multi-level system adapts to changing information processing requirements.